Mountain Rose Herbs is having a pretty great giveaway. They have an interview with one of my favorite herbalists, Kathi Keville, and they’re giving away a copy of her book Aromatherapy: A Complete Guide to the Healing Art along with a Classic Essential Oil Kit. WOW. The deadline is tomorrow, and, to enter, you need to comment on your favorite herb for aromatherapy and post it on your blog and/or comment on their blog. Mountain Rose Herbs is one of my favorite sources for dried herbs, they have grown so much and still kept their quality up, and have a commitment to conservation. So I’m going to share my favorite herb for aromatherapy. Sadly I’m not alone here. How do I love thee, lavender? Let me count the ways. You have seen me through some tough times. You have given me great strength and calmed me at the same time, and for that I am so grateful. For over twenty years, every time I take a bath, I use your healing oil and throw off my cares. I can still the incessant workings of my mind, take a deep breath and even deeper exhale and start anew. I can also ready myself for sleep, if that’s what I need. 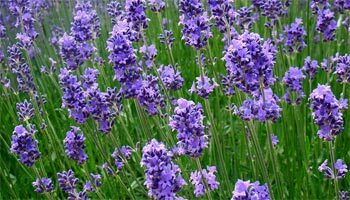 When I was giving birth to my son, almost thirty years ago, I squeezed a bag of lavender to make the labor pains doable, to relax and enable myself to move through to that final letting go. Every time I wash my hair, I put lavender oil in it when it’s still wet, and feel like I’m up for anything. When I leave the house, I put some drops on my head so I can make the transition with calm focus. Every time I walk in a garden, I gently squeeze a bud of lavender and feel like I’m with an old friend who gives my spirit sustenance. I don’t know of another herb that I’ve used so consistently, and that has both a relaxing and reviving effect. I remember visiting Kathi Keville in her garden, must’ve been almost 30 years ago, ’82 or ’83. She told a story about lavender that I’ve never forgotten, and passed on to others. She talked about older women from the garden clubs who would visit her garden, and how she would watch them visibly revive as they passed the lavender, how she could see how it “raised their spirits.” When I first heard that story, I was in my 20s, and now I’m one of those older women, and so grateful for that bit of herbal lore that has always stuck with me, that gets validated every time I pass a lavender plant. This is my favorite way of learning about plants, in bits and pieces of personal stories that get passed from one plant lover to another, maybe getting added to on their journey. When I started writing this, I had been on the computer too long, had just found out about the giveaway, and was not enthused about cranking out a post so quickly at the end of a long day. I rubbed some drops of lavender into my hair, and the love letter flowed pretty effortlessly. So get on down to the Mountain Rose Herbs blog, and write your own love letter.